To mums, daughters are a very important part of their lives. Show your mum that you are in her heart.. Style: Name Necklace/Love Necklace Pendant Size: 30mm~12mm/1.18"~0.47" Hook: Double Hooks ..
Do you have someone's heart? Do you want to show off your best friend forever? Then do it with o.. Style: Name Necklace/Love Necklace Pendant Size: 2.3cm*4*cm(0.92"x1.6") Hook: Single Hook ..
;Style: Monogram Ring/Engraved Ring Width of Ring Band: 5mm/1.96" Thinkness of Ring: 1.2mm Mate..
A perfect gift to connect loved ones, these 4 pendants connect with each other to form a heart. You .. The perfect gift for Mum is just a click away with our Cut Out Kid's Bracelet in Silver . ..
Want to tell someone you love them? Purchase our Engraved Necklace with Heart Cut Out . It mak.. Some friends just fit together like puzzle pieces. The Heart Puzzle Necklace (p.. 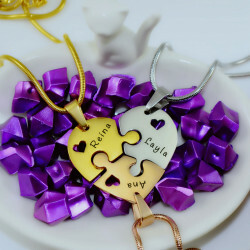 Create your personalised jigsaw piece necklace: Enter the two names to be engraved - Choose a chain ..
A perfect gift to connect loved ones, these 5 pendants connect with each other to form a heart. You ..
Approx 6mm wide 1. Ring size comparison in different countries (Conversion Table) 2. How to .. Style: Monogram Cufflink Thickness: 1.2mm/0.047" Height of Letter: 1.5cm/0.59" Material: 9.. If you share an affinity for butterflies, you will definitely like the Cut Out Butterfly Brace..
Family tree necklaces are the latest fashion trend, especially among mothers, and with the Silver Fa..
;Style: Monogram Ring/Initial Ring Width of Ring Band: 1mm/0.039" Thinkness of Ring: 0.8mm Mate.. Style: Monogram Necklace/Initial Necklace Pendant Size: 3cm /1.2" Hook: Single Hook Chain type:.. Style: Monogram Necklace/Love Necklace Pendant Size: 3cm /1.2" Hook: Single Hook/Double Hooks C.. Style: Name Necklace/Love Necklace Pendant Size: 4CM*1.8CM (1.6"*0.39") Hook: Single Hook ..
A perfect gift to connect loved ones, these 3 pendants connect with each other to form a heart. You ..
A perfect gift to connect loved ones, these 6 pendants connect with each other to form a heart. You .. This flashy ring is custom made with any name! The personalised Silver Cut Out Ring is t.. Some friends just fit together like puzzle pieces. The Forever Friends Puzzle Necklaces are a perfec.. Style: Name Necklace/Love Necklace Pendant Size: 2.5cm/1" Hook: Single Hook Chain type: Rolo Ch.. Style: Name Necklace/Love Necklace Pendant Size: 3cm /1.2" Hook: Single Hook Chain type: Bead C.. Style: Name Necklace/Love Necklace Pendant Size: 2cm*2.7cm(0.79"x1.08") Hook: Single Hook .. Initial necklaces are a really hot trend now, and you too can enjoy this trend with the Gold P.. This two piece set is perfect to wear together or as a modern twist on the best friends necklace. Th.. Style: Monogram Acrylic Necklace Thickness: 0.3cm/0.118" Pendant Size: 5x4.5cm/1.97"x1.8&q..
Show your love with this Puzzle Pendant. This Gold Plated Couple's Necklace is manufactured in S..